The latest addition to Galil’s ever growing line of RIO/Pocket PLC products is the RIO-47162. 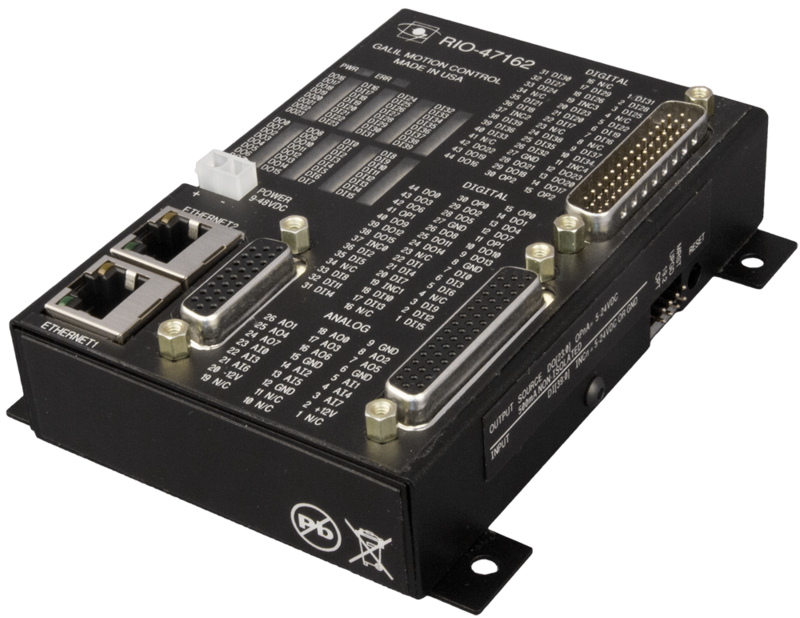 The RIO-47162 has more I/O than previously offered in a very compact package, with D-Sub breakouts and two Ethernet ports. The RIO-47162’s Ethernet ports allow an unlimited number of RIOs to be daisy-chained together without an external Ethernet switch. The RIO-47162’s memory allows 400 program lines, 254 variables, 1000 array elements, 6 PID control loops and 5 Ethernet handles. This new pocket PLC has 40 optically isolated Digital Inputs and 24 Digital Outputs for a total of 64 digital I/O. In addition, the RIO-47162 has 8 analog inputs and 8 analog outputs (16 bit ADC/DAC option available – 12 bit standard). The analog I/O is user-configurable for ±10V, ±5V, 0-10V or 0-5V. The RIO-47162 uses DSUBs for ease of assembly. Dimensions of the RIO-47162 are 3.88” x 4.65” x 1.3” The RIO-47162 is $495 in single quantity and $340 in quantities of 100. It is available for delivery in February. Galil’s RIO Pocket PLC series provides a cost-effective, compact and intelligent solution for programmable I/O control. Standard features of the RIO series include a RISC processor for fast handling of I/O and logic, multitasking, PID process control loops, timers, counters, web interface, email alerts, datalogging, Ethernet and RS232 ports (micro USB on RIO-47162), LED indicators for all digital I/O ports, and an option to interface to position sensors, thermocouples and RTD temperature sensors. The RIO is easy to program using Galil’s intuitive command language. The complete list of RIO-47162 features is listed in Table 1. Table 2 shows currently available RIO models. Measurements 3.88" x 4.25" x 1.30" 3.88" x 4.25" x 1.30" 3.88" x 4.25" x 1.30" 3.88" x 4.25" x 1.30" 3.88" x 4.25" x 1.30" 3.88" x 4.65" x 1.30" 7.19" x 3.52" 7.19" x 3.52" 7.19"x 4.7"
For more information about the RIO Pocket PLC series please see RIO-47xxx or speak to a Galil Applications Engineer at 800-377-6329.